Hello again, from the sunny Maldives! 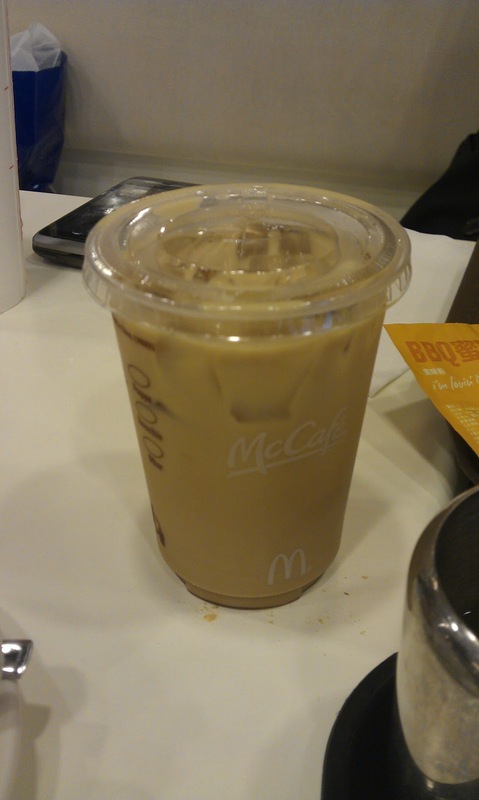 I visited Hong Kong last week before heading to Sri Lanka, so this is my McD's recap for the week. Also sorry for being a day late, as I was in transit to get here all day yesterday. Unfortunately I came to Hong Kong at a time where their promotional item was the McRib, and since I have tried the McRib before in Long Beach CA. I didn't want to have that again, so I thought it was a perfect time to get one the McCafe Sandwiches which I hadn't ever bothered to try before. I have always avoided the McCafe menu from HK as they were always more expensive than the standard menu, and usually when I am there, they have limited edition items for me to sample . Of all the sandwiches and wraps on offer, the most interesting and unique sounding one was the New 'Mango & Chicken Panini' (which, strangely, isn't on the McCafe website). It was rather small, and had a strong mango flavour. It almost tasted more like mango jelly on flat bread, rather than a chicken Panini, I guess the mango puree is cheaper than the chicken strips, so they put more mango than chicken. The sandwich on its own was 26.50$, but you could add it to any drink for only 15$, so I ordered a ‘long black’ coffee for 15$ and added the sandwich to get the coffee for pretty cheap. Thinking my mate Hugh would try half of the sandwich, I also went with the new cheesecake offering, as it was something I haven’t tried before. 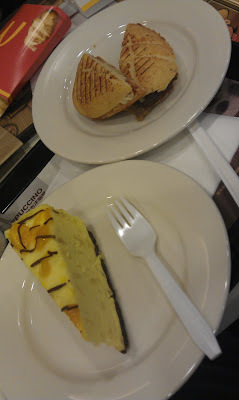 Keeping with the mango theme, I tried the Mango & Hazelnut cheese cake, and also did the combo thing. I got a HK style milk-tea for 15$ and added the cheese cake for an additional 12$ (original price was 23.50$) so the milk-tea was nearly free. Living in Korea, where the cakes look great, but are mostly air and tasteless, this cheesecake was rich, dense, and heavy, just like a cheesecake should be. The mango wasn’t overpowering like in the sandwich, and the nuts were evenly distributed throughout the piece. The chocolate crust was a nice touch too, it was thick and also quite rich. I can’t say anything positive about the milk-tea at all. I love HK milk-tea, but this was the worst I’ve ever had. Usually, they give you a sugar packet on the side, to sweeten it to your liking (I don’t add any), but I watched them make it, and they added three pumps of liquid sugar without asking, which pretty much ruined it for me. I had the coffee to drink and Hugh had a coke with his McRib, so I wasn't going to bother asking them to remake it. Two obligatory tiny sips, and straight into the trash it went. In retrospect instead of the coffee with the sandwich I probably should have tried one of the promotional coffees on offer, Ginger Bread Latte, or a Mint Mocha, but knowing my hatred of sugary coffee drinks I'm sure their fate would have been the same as the milk-tea.